Two of the new rockets will be selected in a second competition, providing assured access to space through the next decade and beyond. In a surprise to some observers, SpaceX, the ambitious rocket company founded by Elon Musk, was not among the latest winners in the Pentagon's Evolved Expendable Launch Vehicle program. The Launch Service Agreements "will facilitate the development of three domestic launch system prototypes and enable the future competitive selection of two National Security Space launch service providers for future procurements, planned for no earlier than fiscal year 2020," the Air Force said in a statement. The public-private partnerships will ensure "the U.S. maintains assured access to space, with at least two domestic launch service providers and without reliance on non-allied rocket propulsion systems." The contracts will be "incrementally funded" through 2024 and managed by Air Force Space Command's Space and Missile Systems Center in Los Angeles. "These awards are central to the Air Force goal of two domestic, commercially viable launch providers that meet National Security Space requirements," Lt. Gen. John Thompson, SMC commander, said in a statement. "These innovative public-private partnerships with industry provide a path to develop launch vehicles to assure access to space, address the urgent need to transition away from strategic foreign reliance and provide responsive launch capabilities to the warfighter." United Launch Alliance, a partnership between Boeing and Lockheed Martin, won a $967 million contract to develop its Vulcan Centaur rocket, a powerful launcher that will replace the company's venerable Delta 4 and Atlas 5 boosters. The Atlas 5's use of Russian-built RD-180 first stage engines has generated widespread controversy in recent years, but the new Vulcan Centaur will use two of Blue Origin's BE-4 engines in its first stage and Aerojet Rocketdyne RL10 engines in the Centaur second stage. The Vulcan's first stage engine compartment can be jettisoned in flight for recovery, refurbishment and re-use. Strap-on solid-fuel boosters also can be attached to the rocket for additional liftoff power depending on payload requirements. ULA will launch the rocket from pads it already operates at the Cape Canaveral Air Force Station and Vandenberg Air Fore Base, Calif.
Orbital Sciences, recently acquired by Northrup Grumman, won a $791.6 million contract to develop the company's Omega launch system, a rocket that will be "capable of launching the full range of national security missions required by the U.S. Air Force, as well as science and commercial payloads for other customers," the company says on its web page. The Omega rocket uses a large solid-propellant first stage and hydrogen-fueled RL10 engines in its upper stage. The rocket will be launched from the Kennedy Space Center in Florida and Vandenberg Air Force Base. Blue Origin won a $500 million contract to help develop its New Glenn booster, a rocket with a fully reusable first stage powered by seven BE-4 engines burning liquefied natural gas. A single BE-4 will power the rocket's second stage and a third stage, using a BE-3 engine, also can be used depending on payload requirements. 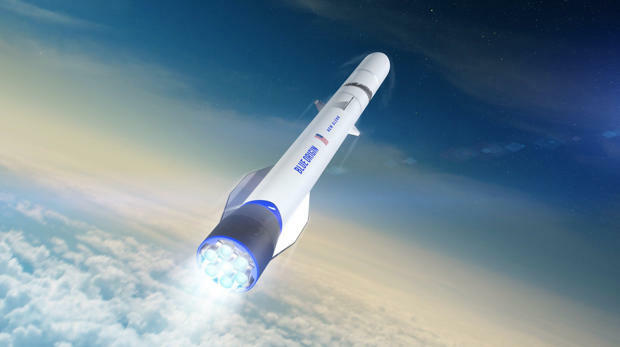 "Blue Origin is honored to enter into a Launch Services Agreement partnership with the Air Force to leverage our commercial, heavy-lift New Glenn launch vehicle for national security space missions," the company said in a statement. "The LSA partnership enables rapid buildout of NSS-unique New Glenn infrastructure such as vertical payload integration capability and a launch site at Vandenberg Air Force Base as well as completion of NSS certification activities." Blue Origin recently completed a huge new rocket manufacturing facility just outside the Kennedy Space Center and is modifying a launch pad at the nearby Cape Canaveral Air Force Station to support New Glenn flights. In a tweet, Bezos thanked the Air Force "for your confidence in the @BlueOrigin team and our #NewGlenn rocket. We are proud to serve the national security space community and are committed to providing safe, reliable access to space for the nation." While the new prototypes are being developed, the Air Force statement said the department will continue to "competitively award commercial launch services contracts to providers who demonstrate the capability to design, produce, qualify and deliver launch systems and provide the mission assurance support required to deliver National Security Space satellites to orbit." SpaceX was not part of the award announced Wednesday, but the company's Falcon 9 rockets are used to launch military satellites, NASA spacecraft and commercial payloads from the Cape Canaveral Air Force Station and Vandenberg. The company also offers a heavy lift three-core Falcon Heavy and is developing a huge new rocket known as the BFR to eventually carry passengers to the moon and Mars. SpaceX recently announced plans to launch a Japanese billionaire and a half-dozen artists on a flight around the moon.